I love, love, LOVE my condo. When I was searching for my first home, I already knew from a few years of apartment living what I did NOT want. * I didn't want the hassle of poor office management and sloppy lease agreements. * I didn't want to deal with obnoxious neighbors and poor community morale. The more social the complex, the better. * I didn't want to have to deal with hauling groceries from the car to a walk-up. Elevators were a must. * I didn't want to feel unsafe opening my door at night. This one was applicable while in an apartment off Marietta St. back before that area was revitalized a bit. Single girl in scary area = not so much. What I did want, I was lucky enough to ultimately find in my home today -- peaceful, swank, upscale living close to public transportation, stores and restaurants all in walking distance. Something centrally-located with my friends, family, and my job. A place with lots of amenities to make me and my guests feel pampered. Somewhere that I can come home to now, two years later, and still look around and be extremely happy where I am. Are any of you out there are searching for new homes, be it a new lease situation or a new place to buy? What are your Wants and Don't Wants in your home? In related news, I want to tell you all about my friend Annemarie's condo, located on the Westside by Collier and Howell Mill. 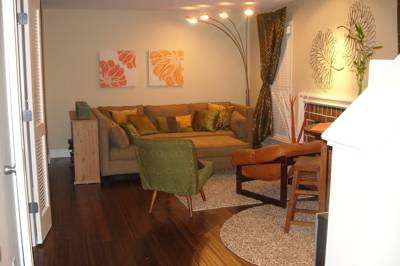 Annemarie is looking to rent out her 3-bed, 2.5-bath home at a steal of a price. It's a perfect home for anyone hoping to be close to the social scene of Buckhead and Midtown, while also feeling like a residential area with cute houses and sidewalks. This isn't your typical young-person apartment with cheapo decor, either. She has it partially-furnished and decorated in super swank Buckhead Betty style, the stylish gal that she is, so you don't even have to worry about buying things like couches and tables when you move. If you know of anyone looking for a great place to rent, please help us pass on the word!